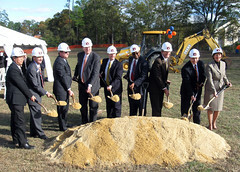 This entry was posted in Events, General News and tagged auburn, center for advanced science, commerce, ground breaking, innovation, university on November 18, 2011 by Wire Eagle. AUBURN – Construction will begin soon on a $28.8 million science center designed to foster multidisciplinary research collaborations across the Auburn University campus that will generate new knowledge and technology to benefit Alabama. Groundbreaking ceremonies for the 84,000-square-foot Auburn University Center for Advanced Science, Innovation and Commerce, or CASIC, were held Friday, Nov. 18, at the Auburn Technology Park. The CASIC building is being funded by a $14.4 million grant from the U.S. Department of Commerce’s National Institute of Standards and Technology and matching dollars supplied by the state of Alabama along with support from Auburn University and the Alabama Agricultural Experiment Station. The new center will feature 20 laboratories as well as shared support spaces and specialized equipment areas for scientific research in bioenergy, water quality, food safety, genomics, information science and ecosystem health. Researchers from Auburn’s colleges of Agriculture; Engineering; Sciences and Mathematics; and Architecture, Design and Construction; and its School of Forestry and Wildlife Sciences will be housed in the facility. This entry was posted in Community, General News and tagged commerce, Community, Development, ecdi, economic on October 6, 2010 by Wire Eagle. AUBURN – Auburn University’s Economic & Community Development Institute, or ECDI, a partnership of Auburn University and the Alabama Cooperative Extension System, will use $1,003,000 in grant funds from the U.S. Department of Commerce for a project designed to bridge the digital divide and promote engagement in the digital economy across all of Alabama’s 67 counties. The project will employ interactive computer-based programs to educate and train Alabama residents and community leaders in the social and economic benefits of broadband technology and will utilize targeted statewide and regional media campaigns to increase awareness of broadband’s practical applications. This entry was posted in Community and tagged broadband, commerce, grant, rural on September 27, 2010 by Wire Eagle. AUBURN – The U.S. Department of Commerce has awarded an Auburn University outreach initiative $4.6 million to expand the availability of broadband technology in Alabama’s rural libraries and schools. In announcing the awards, Commerce Secretary Gary Locke said that when you don’t have access to high-speed Internet, you don’t have access to all the educational, business and employment opportunities it provides. Overall, the initiative will deploy 1,000 new computer workstations and replace nearly 500 more at 94 rural libraries and 21 public schools across Alabama. Auburn plans to use the new equipment to offer online training programs and telemedical applications to underserved rural areas. This entry was posted in General News, Research and tagged bioenergy, commerce, food safety, grant, science, stimulus on July 20, 2009 by Wire Eagle. AUBURN – Auburn University will receive $14.4 million in federal stimulus funds for construction of a science, technology and commerce research facility, university officials announced today. The competitive grant is from the U.S. Department of Commerce’s National Institute of Standards and Technology. It will aid Auburn researchers working on standards, measurements and forecasting related to food safety, bioenergy technologies, aquaculture development and sustainability, and water and environmental quality.